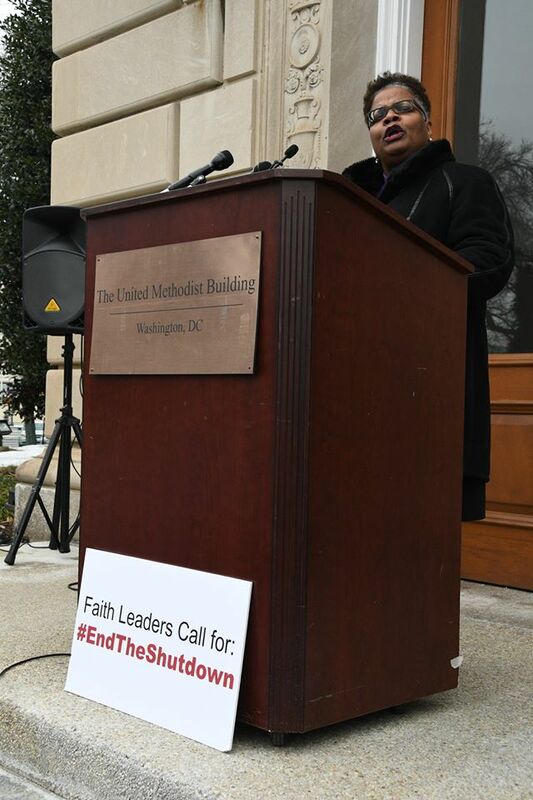 Faith leaders from around Washington, D.C., stood in the cold Thursday afternoon, Jan. 17, calling for lawmakers and President Donald Trump to end the almost four-week government shutdown. These people hold jobs, the bishop said, but they are concerned about when they are going to be able to go back to work. To address this situation, the bishop and other faith leaders wrote a letter and hand-delivered it to the White House, to Speaker of the House Nancy Pelosi (D-Calif.), and Senate Majority Leader Mitch McConnell (R-Ky.). Bishop Mariann Budde, Episcopal Bishop for the Diocese of Washington, read the letter to start a press conference on the steps of the United Methodist Building, across the street from the Capitol. The response, she said, was immediate. The letter was drafted and posted online, which, as of Thursday night, had more than 930 signatures. The letter issues a call to justice and hope during the ongoing federal government shutdown. “We are deeply concerned for all those who lives have been thrust into economic uncertainty,” it states. 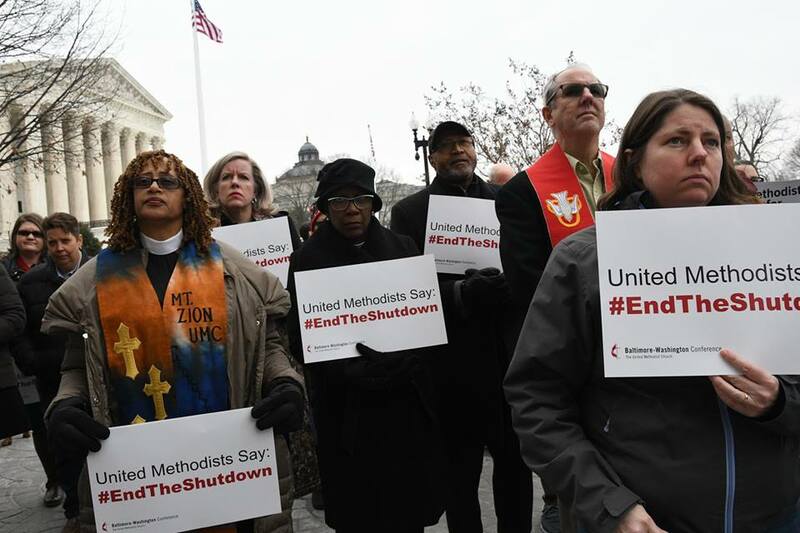 It references "the disproportionate burden the shutdown has placed on federal employees and contract workers" - many of whom are leaders in local faith communities. It states, "The long-term consequences of the shutdown are mounting, and we respectfully add our voices to those calling for it to end." The faith leaders also addressed the humanitarian crisis for migrants at the U.S. Southern border, writing: "On the issues of border security and our immigration policy, we agree with President Trump that we face a crisis of heart and soul, though we differ dramatically in our understanding of it." Human migration, Bishop Easterling said in her statement at the press conference, is as old as human history. The bishop serves as a member of the Council of Bishop’s Immigration Task Force. READ Bishop Easterling's full statement. The letter states that the crisis is multi-faceted and complex and will require solutions equally diverse. "In the meantime," they add, "people are suffering and we cannot turn away." Several speakers noted that those most hurt by the shutdown are the most marginalized in society. “Even as President Trump signed a bill guaranteeing back-pay to some, those who are contract employees have absolutely no guarantee of back-pay or even returning to their jobs at all,” said Bishop Easterling. Susan Walters and Karen Collins, members of Emmanuel UMC in Laurel, attended the event. Both are employees of the Department of Justice’s Bureau of Prisons main office in D.C. Both are furloughed. In this time off, they say they’ve gained a new realization about how much they value their friendships at work, their daily routines, and the purposefulness that accompanies being engaged in meaningful work. In the weeks of not reporting to an office, they’ve enjoyed time spent working for the church. The uncertainty and bitterness that accompanies the partial government shutdown for some people, has drawn them more deeply into their faith. At Mount Vernon Place UMC in the heart of Washington, the ripple effects are noticed every day by the church’s pastor, the Rev. Donna Claycomb Sokol. It’s not just the furloughed government workers, either. She sees it in the empty chairs at the restaurants, the school children who come for field trips and face closed museums, and the hot-dog vendor on the corner who’s had to close-up shop. Mt. Zion UMC in Georgetown has several federal government employees in their congregation, said the church’s pastor, the Rev. Johnsie Cogman. That includes her husband, who is currently working for Homeland Security without pay. One of the things her church is known for is food, Cogman said, and that includes feeding the homeless and the community every Saturday. This weekend, they’re expecting many more people to walk through their doors. Church members are also standing by with hot meals when others let them know of the need. To read the full letter and/or add your name to the list of signatories, visit https://bit.ly/2TRujJC. The church did not mourn when my father was furloughed from his civilian company position. He ended up taking a janitorial position to support our family. I have no sympathy for overprivaled government employees with guaranteed jobs to return to when the furlough is over with a President Trump signed guarantee of full back pay. Teach a man to fish..... So the old saying goes. By bringing illegal immigrants into the country and protecting them in sanctuary cities, we are not showing God’s love. We need to be in their country, helping them improve their lives and the lives of their countrymen. That’s why I’ve been to Haiti 6 times this decade. We see the results of our mission work!! Please pray that God would soften Speaker Pelosi’s heart and that she would support building the wall to protect US lives. Too many US lives have been lost because because of her heart being hardened just like Pharaohs. She used to support the wall but because Trump is in office, all she can say is “resist”.